(Bloomberg) -- Samsung Electronics Co. reported its worst operating-profit drop in more than four years, buffeted by falling memory-chip prices and slowing smartphone sales. Samsung shares fell 0.5 percent in early Seoul trade on Friday. The stock had gained 21 percent this year through Thursday’s close after slumping 24 percent in 2018. Data centers are working through their stockpiles of unused memory chips while Apple cut its sales forecast earlier this year amid continued trade frictions between the U.S. and China. 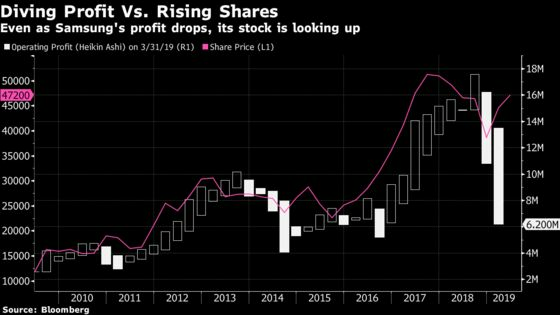 The Chinese economy, the biggest destination for Samsung-made components, has been slowing as well, while the World Trade Organization has cut its 2019 trade projection to the weakest in three years. Sales for the quarter were 52 trillion won, missing expectations for 53 trillion won. Samsung won’t provide net income or break out divisional performance until it releases final results later this month. The market for dynamic random-access memory is set to reach $77 billion this year, dropping 22 percent from a year earlier, according to IHS Markit. In the first quarter, contract prices for 32-gigabyte DRAM server modules fell 38 percent while those for 128 gigabit MLC NAND flash memory chips slid 23 percent, according to inSpectrum Tech Inc. DRAM prices fell in the “sharpest decline in a single season” since 2011, TrendForce said on March 5. In January Samsung said it was reducing spending to focus on the profitability of its memory operations after fourth quarter net income plunged the most in two years. Rival SK Hynix Inc. said it could also cut investment if necessary. Last month Micron said it was curtailing output. 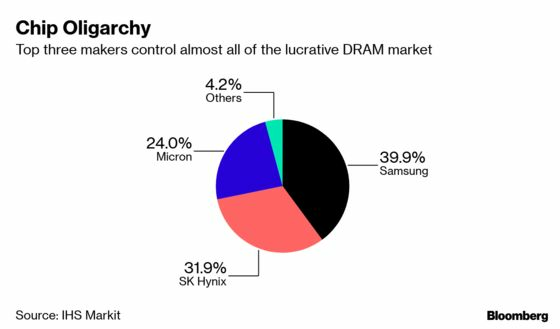 The three companies control the bulk of the market for DRAM chips, used to store data on personal computers and servers. Samsung’s first-quarter profit included the sales of Samsung’s Galaxy S10 smartphone released last month. Samsung has been struggling to stem a decline in its smartphone business as consumers wait longer to upgrade their devices. Its display division, which supplies Apple, has also been hurt by lower-than-expected sales of iPhones and competition from Chinese makers of monitors and televisions. Apple cut its revenue outlook in January for the first time in almost two decades.